Using instruments aboard the Cassini spacecraft to measure the wobbles of Mimas, the closest of Saturn’s regular moons, a Cornell University astronomer publishing in Science, Oct. 17, has inferred that this small moon’s icy surface cloaks either a rugby ball-shaped rocky core or a sloshing sub-surface ocean. 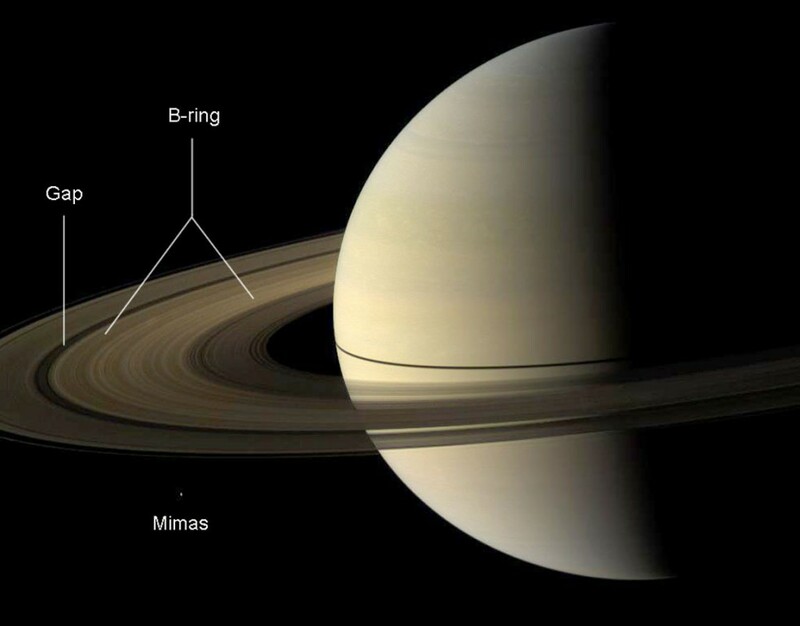 “After carefully examining Mimas, we found it librates – that is, it subtly wobbles – around the moon’s polar axis,” Radwan Tajeddine, Cornell research associate in astronomy and lead author of the article. “In physical terms, the back-and-forth wobble should produce about 3 kilometers of surface displacement. Instead we observed an unexpected 6 kilometers of surface displacement,” he said. “We’re very excited about this measurement because it may indicate much about the satellite’s insides. Nature is essentially allowing us to do the same thing that a child does when she shakes a wrapped gift in hopes of figuring out what’s hidden inside,” Tajeddine said. The astronomy team used a technique called stereo-photogrammetry to interpret images taken by the Cassini Imaging Science Subsystem to measure the libration. In this technique, astronomers employ Cassini photographs of Mimas taken at different times and from various vantage points to build precise 3-D computer models of the locations of hundreds of surface reference points. From these, the researchers determined the moon’s shape and were able to notice that the satellite didn’t rotate smoothly but rocked back and forth a bit as well. The amount of the to-and-fro motion indicates that Mimas’ interior is not uniform. These wobbles can be produced if the moon contains a weirdly shaped, rocky core or if a sub-surface ocean exists beneath its icy shell. 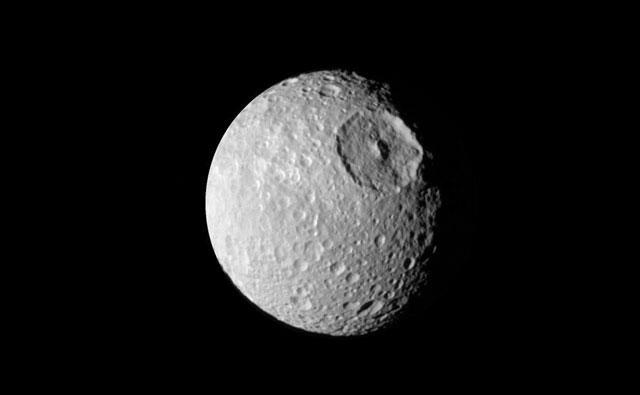 Mimas is about 400 kilometers in diameter, and its possible internal global ocean is located under an icy crust ranging in thickness between 25 and 30 kilometers. The moon itself is thought to have been formed either by the slow agglomeration of ring particles (a gradual buildup of matter) or direct growth within the primordial planetary gas nebula. The odd-shaped core would favor gravitational flattening by nearby Saturn, Tajeddine said. The moon’s relatively smooth and roughly spherical icy surface covers up whatever is underneath.